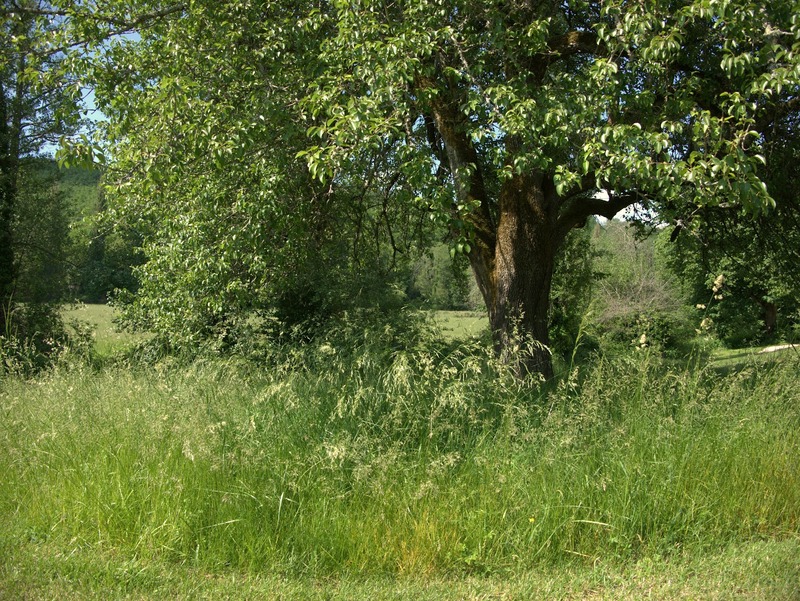 Each year I seem to leave ever larger areas of grass uncut. Not because I'm on some' ditch' the lawn tip or similar, rather it's a matter of creating a perfect environment in which the crickets choral society can congregate. And now the weather's hotting up, boy can they sing. The sound of Summer. I like to cut paths through it, a kind of lawnmower topiary which is better than ever as the grass is nearly waist height courtesy of a wet April. 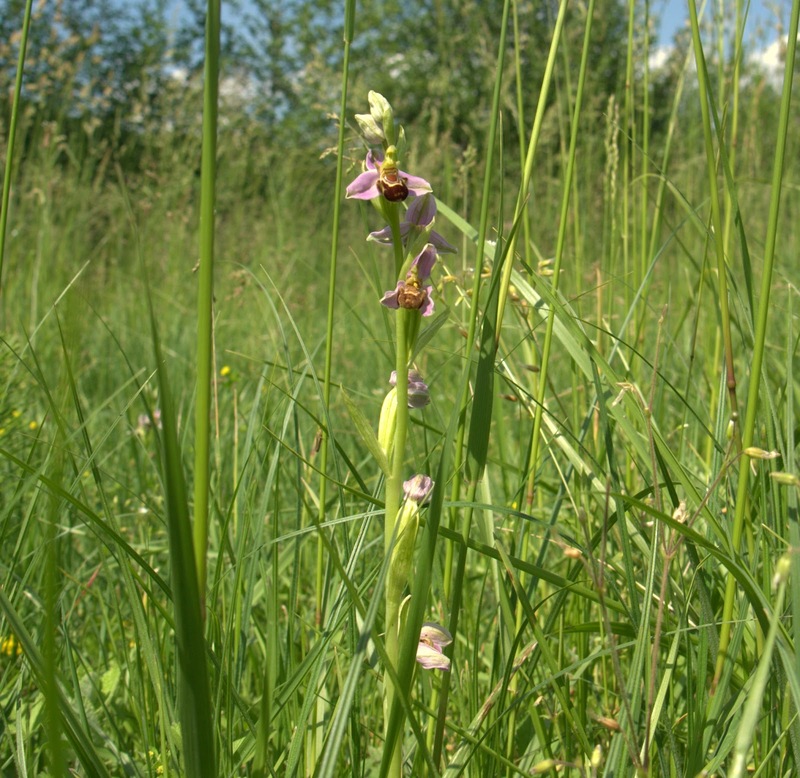 Best of all things unexpectedly pop up, like wild orchids. I struggled to get a good photo this afternoon, it was impossible to lie down (didn't want to flatten the grass) so arms stretched downward, camera by my knees. Below is a better pic, taken a few years ago. 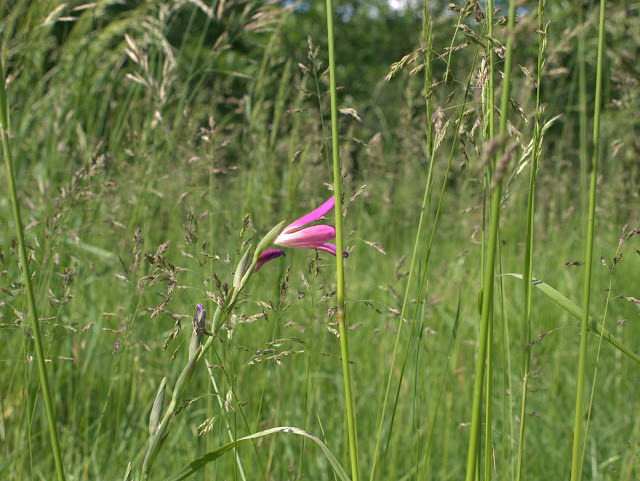 Gladiolus byzantinus makes an appearance. These aren't wild, I planted about 125 corms back in 2009. I've completely forgotton what this is. Very common, very pink, very welcome. 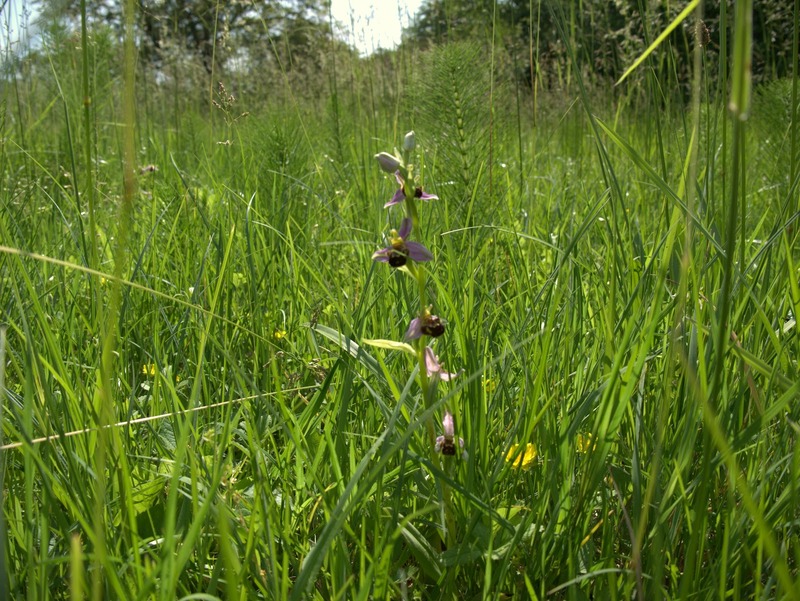 There are at least twenty bee orchids (least I think they're bee) in that grass area. It must be something to do with the all the rain in April, there were none last year and a few the year before. Thanks for this little peep into paradise. 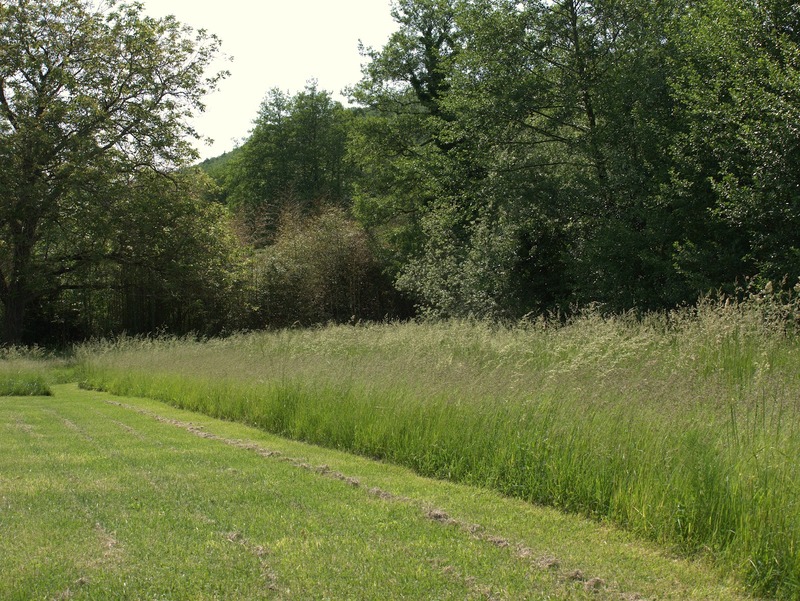 I love the pathways through the wildness of the long grass. The crickets pipe up as the temperature rises. What lovely surprises. Perhaps your garden will become a haven for all kinds of wildlife. I wonder what my pop-up in my garden if I were to follow your example. Thanks Anna, even creeping buttercup looks good in the grass. Mowed paths through grassy fields are a favorite of mine. The grass is particulary tall this year, so a path through it almost starts to feel like a maze. Hi Rob! How beautiful! Smell of grass should be so wonderful and reminding of a childhood in countryside. Tatyana thanks. I agree, it's a smell I associate with childhood. Definitely. We get the occasional Cicada in high Summer. They sit in the trees and making a loud rasping noise when the weather's hot. Hopefully it won't be a bitter winter in NZ. I love the grass left like that. It's quite a job cutting it come late Autumn mind! I am doing the exact same thing in my garden--leaving a large area unmowed. 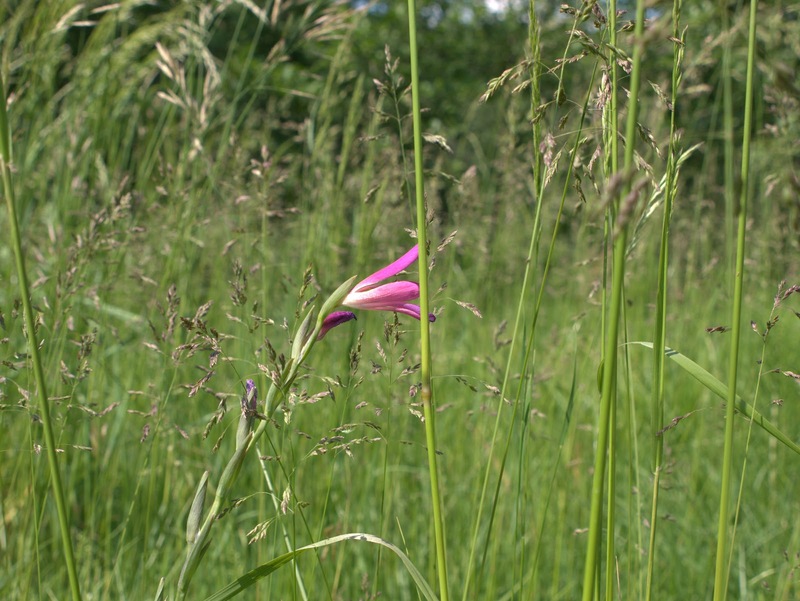 Nothing as beautiful as an orchid or gladiola has popped up, but the birds and insects are loving the wild place. You never know what might pop up. I think your paths mowed through natural grass areas is quite effective as a garden. I'm sure over time, other wildflowers will emerge and take up residence from seeds on the wind or carried by birds and other animals. I have no knowledge of French wildflowers for your region, but that pink flower is lovely. I think to really get lots of wild flowers I'd have to weaken the grass as it crowds most things out, but I like it as it is. There does seem to be a lot of wildflowers in this region. I particularly love the blue wild chicory which lines the roadsides later in the summer. Hi Marie, the grass has been really showy this year and tall. Last years drought kept it short and with subdued inflorescences. 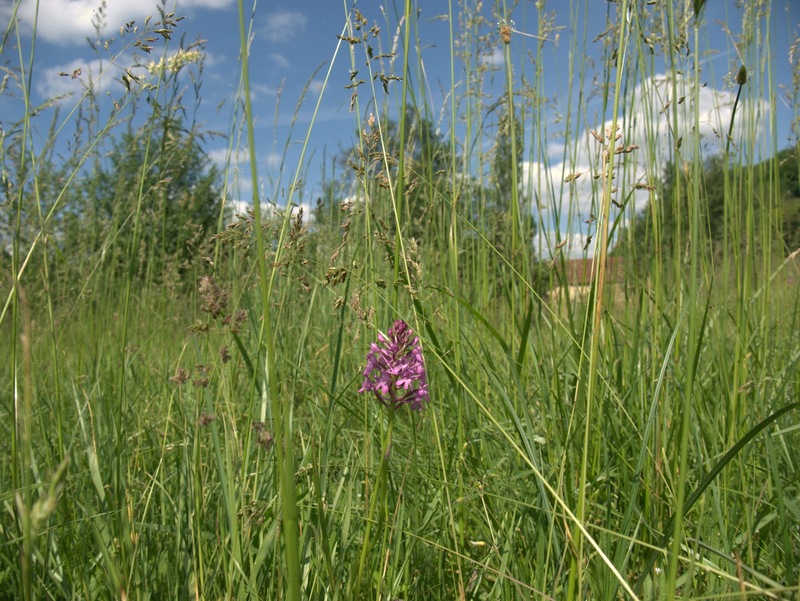 Hi Rob, the pink beauty is a French wild orchid, they come by thousands in spring where my dad lives in Le pays Cathare. The sound of summer, it's exactly what I said to myself yesterday when walking my border collie near a waving field of wheat. Oh how I love it ! Celine thanks. That orchid is plentiful here too, particularly this year. Definitely summer weather at the moment. Those orchids are awsome !!!! And the sound of crickets .....I love it ! I'd love to live in France, here in Belgium we have no crickets but I know the sound from our holidays. There are more orchids this year than I can remember. The crickets should pipe up with warmer weather. I mentioned your blog in my latest post: http://mary-goingnative.blogspot.com/2012/06/you-are-my-sunshine.html Check it out, if you like. We arrived home after a month in France to find our grass lush, green and long. I like the idea of cutting paths thru the grass.